superdumb supervillain: Sweet Soaps and Eden Fantasys Giveaway! Sweet Soaps and Eden Fantasys Giveaway! I'm shrugging off my mostly vegetarian leanings to say that the bacon soap is cool! Does it even have a bacon smell? I've been naughty and nice, so this stash would be for me! I can't believe how the holidays have snuck up this year! Hanukkah starts this weekend, Christmas is only two weeks away… it all seems too close for my comfort. 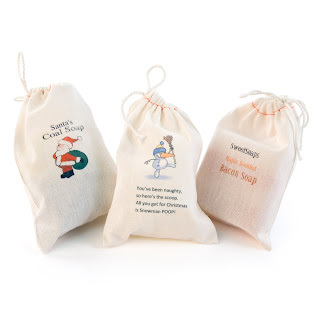 My friends at Eden Fantasys told me about SweetSoaps, a New Jersey company that makes natural bath products that are perfect stocking stuffers. They have a selection of gift soaps embossed with elegant motifs or your custom logos, but my favorites are the specialty holiday soaps: a lump of coal, a white chunk of snowman poop. And how hilarious is the bacon soap? It's always bacon season! Eden Fantasys has plenty of stocking stuffer ideas under $20 for folks on your list who are naughty in a nice way…in fact, today only they are offering 30% off of 47 selected adult toys in their "Crazy Thursday" promotion! I'm not entirely sure what the Jollie soft below does but it looks like gooey sprinkled frosting for your nethers and it's almost $60 off today, so here's a good opportunity to try it. Woo-hoo! Eden Fantasys and SweetSoaps have teamed up to create a holiday gift basket sure to warm up even the grinchiest person on your list. 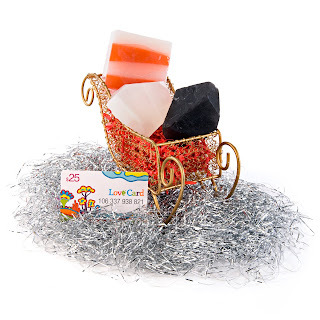 Three SweetSoaps specialty soaps: bacon, coal and snowman poop and a $25 gift card to Eden Fantasys! Ho, ho, ho! To enter and win an adorable holiday gift assortment from SweetSoaps (featuring a $25 gift certificate to Eden Fantasys!) , please comment on this post and let me know who's been naughty or nice this year. Entries will be accepted through December 18th and I'll pick the winner using Random.org. US readers are eligible. Um, I don't want to win that sparkly thing but bacon soap sounds cool. Woohoo! I have been naughty lately, indulging in junk food more frequently than real food. Well....to tell the truth, I myself have been naughty this year. So whaddya keeping score for Santa? Actually, I find it works best for me to be naughty so I think I need more naughty toys. My husband has been pretty nice this year. I've been very nice this year and could use some naughty things. My boyfriend and I have been naughty and nice! Very cute products! Hope I win! My kids would say I have been naughty (I have been saying NO alot lately) But I think I have been very good! Well I guess I'm out of the running! lol But on the brighter side my momma has been super nice and would just love this gift! I subscribe via email too!